We’re constantly on the lookout for the newest, emerging Rodent Pest Control Products and Services. Why not sign up here and be notified as when we’ve updated our offerings? You can use this handy form to the right. You can also send us YOUR requests! What products or services would YOU like to see offered? Drop us a note or give us a call. If you have a specific question about any of our Services or the products we use feel free to contact us, we’re here to help you stay rat, mice and rodent free! We believe in informing the customer and allowing them to make an informed decision. This information is by no means exhaustive. If you have any rat, mice or rodent questions that you don’t see covered here please feel free to use our handy form or give us a call. 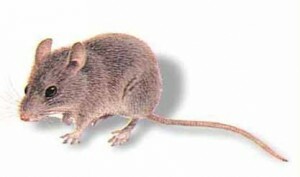 Roof Rats: Have soft smooth fur, pointed muzzle, large eyes and large almost naked ear, which can be pulled over the eyes. Scaly, dark tail is longer than combined head and body length. 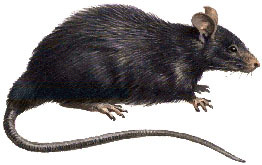 The roof rat (Black rat, ship rat) adult head and body length is 6-8 inches; tail length is 7-10 inches; weight is about 5-9 ounces, up to 12 ounces. Outdoors, roof rats nest in high places such as trees, but sometimes in burrows under plants. Indoors: they nest in high places in structures, but sometimes in basements, sewers, or under buildings. Roof rats eat almost anything, but they prefer fruit, vegetables, and cereal products. They get their water often from their food. They eat a lot at one time, and they return to that place time after time. If they do not like a food or bait they quickly become shy of it. Roof rats mature in 2-5 months, and are adults for 9-12 months. Pregnancy takes 3 weeks. Newborns get hair after 1 week, open eyes after about 2 weeks, and are weaned at 3-4 weeks. Females have 4-6 litters per year, with 6-8 young per litter. They have keen hearing, smell, taste and touch (long whiskers), but bad vision, and are colorblind. They are good at running, climbing, jumping, and even swimming. They are nocturnal and explore a lot, but are cautious and shy away from new objects. Roof rats gnaw, eat stored food, and transmit diseases by droppings and urine, bites and fleas and mites in their fur. An opening larger than 1/2 in.allows entry of roof rats into buildings. House Mice: are light brown to light gray in color, with large ears, pointed snout and a small, slender body. The length of the head and body is usually 3 to 4 inches, and the scale-ringed, sparsely haired tail is about the same length. House mice can be distinguished from young rats, because young rats have relatively large feet and a large head, usually with a blunt snout and small ears. Orchard Mice and other outdoor species of mice usually have a blunt snout and their ears are almost hidden in their thick fur, which is often darker brown or reddish in color. Outdoors, mice eat seeds, fruits, grubs, roots, buds and bark. Indoors, house mice can eat any human food, and have even survived on flour alone and on meat alone. House mice mostly take small meals 10 to 20 times each day, mostly in different places, within a distinct territory which they mark with their urine. Most feeding is at dusk and just before dawn. Mice have a much lower need for water than rats and can survive without drinking at all if they eat food with a high moisture content. When water or moist food is in short supply house mice can lose up to 40 percent of their body weight and, like a camel, make a dramatic recovery after a single drink of water. Mice can breed throughout the year, raising their young within nests in such places as wall voids, attics, basements, and even inside sofas and armchairs. The gestation period is about 43 weeks and there are usually 5 to 6 mice per litter, and up to 10 litters per year where there is plenty of food. Young mice are weaned in 3 to 4 weeks and can start breeding when they are only 6 weeks old. Most wild mice live less than 12 months, although caged mice have lived up to 6 years. What Can You Do Against Rodents? Rodents can be discouraged by making it harder for them to get into buildings and by reducing the available food and nesting places. However, keeping rodents out is difficult because they climb so well and can squeeze through crevices only 3/8 inches wide. Likewise they are very good at finding food and nesting sites. Even the best sanitation and rodent-proofing measures cannot be expected to achieve more than 89 percent control. Total elimination of indoor rodents is essential because of the dangers they represent, and this requires active killing measures using traps or chemicals known as rodenticides. However, the use of traps and rodenticides requires great skill in order to be effective and to avoid hazards to people or animals. The main skill lies in choosing the right positions and right numbers of traps or rodenticide placements. In the case of rodenticide baits, special bait stations may be required to safeguard children and animals. Also, because mice are often more resistant to rodenticides than rats, particular care must be taken to choose effective products, many of which are not available to homeowners. For these reasons, the use of traps and rodenticides is often best left to professionals. However, listed below are 10 specific measures you can carry out to protect yourself and your property against rodents. 1. Store garbage in sound, metal containers with tight lids. 2. Store food in rodent-proof containers. In the case of pet food, only put out what pets will eat and don’t leave any food exposed overnight. 3. Regularly inspect food stocks, quickly clean up any food spills and dispose of any packages which have been penetrated by mice. 4. Seal holes leading to wall voids and pick up any long-term clutter or debris to reduce nesting opportunities for rodents. 5. Store firewood, boxes, etc. 18 inches off the ground and at least 1 foot from walls to reduce cover or nest sites for mice. 6. Discourage rodents living too close to your home by trimming or removing vegetation around foundations and moving bird feeders and kennels further from the building. 7. Fit tightly closing exterior doors and keep all doors closed when not in use, including garage doors. 8. Cover exterior vents with 20-guage wire screen of 1/4 inch mesh to exclude rodents. 9. Patch any holes in exterior walls with concrete. Coarse steel wool can be rammed into small holes as a temporary measure to exclude rodents. 10. Check any incoming supplies, particularly boxes which have been stored in garages and outbuildings, to prevent hidden rodents being carried indoors. Note: For several years various electronic devices have been marketed as a “clean, safe” method of controlling rodents. Many of the claims made for these devices are not supported by facts. Scientists are generally agreed that electromagnetic devices do not work and Federal court orders have prohibited the sale of several of these products. In the case of ultrasonic devices, which can produce high frequencies and amplitudes of sound, there is some evidence that they can affect rodent behavior. However, they are usually ineffective unless they are installed and maintained by professionals and used by them in conjunction with traps and rodenticides. 1. Rats and mice are among the most common mammals, ranging throughout the world from the tropics to the Arctic , and spreading easily via trucks, trains, ships and aircraft. 2. Rats and mice have been known as pests for thousands of years and the ancient Greeks and Romans were among the first to use pesticides to control them. 3. Many species of rats and mice live entirely outdoors and by gnawing roots and bark are a major cause of tree injury and death in forests, orchards, nurseries and yards. 4. There are periodic population explosions of outdoor rats and mice during which their numbers may exceed 50,000 per acre and result in frequent invasions of nearby buildings. 5. Rodents are capable of living outdoors but the majority spends their whole lives indoors, mostly within 10 feet of where they were born. 6. Rodents have become the most common mammalian pest of buildings in the world, largely because of their amazing adaptability and fast breeding. A single pair can give rise to over 3,000 in 1 year. 7. Rats and mice are very short-sighted, but have superb senses of smell, taste, hearing and touch which enable them to move around easily at night and find food. 8. Rodents thrive on all types of food, including human junk food, which they can reach by climbing, jumping, tunneling, swimming or gnawing. 9. Rodents contaminate food with their urine, hairs and droppings, and spread disease organisms, especially those causing food poisoning. Outdoor species are involved in spreading other diseases, including plague and Lyme disease. 10. Rats and mice cause major economic losses by gnawing on building materials and packaging to reach food, and by chewing paper and clothing to make nesting material. Many fires are caused by mice chewing on electric wiring. If you’re interested in the Rodent Pest Control Service offered by Termite Terry please feel free to call us at 949-631-7348 in order to set up an appointment or use our online Order Form and we’ll get back to you as soon as possible.